How Do You Change Kenyan Education? In some countries around the world, such as Egypt, Kenya, and Romania, the education system is examination-oriented, meaning that test scores, rather than learning, become the ultimate goal of education. According to a report of the International Journal for Innovation Education and Research, this ultimately distorts students’ motivation and learning, by overstressing the importance of exam results as a measure of students’ abilities. At its worst, an examination-oriented education system can stifle many students’ imagination, creativity, and sense of self, hindering their success in and out of the classroom. Through her nonprofit, A Million Faces-Renaissance, Dorcus Odera, a 25-year-old Kenyan living in Nairobi, is a young woman ardently fighting to change the Kenyan education system’s focus on exams, by seeking to identify children’s greatest abilities and cultivating those to discover the peculiar bent of the genius in each through education. Apart from that, she is also a member of the founding team of Peace for Africa and Economic Development (PAD), a youth organization that aims at empowering youths economically, by using their talents to help them come up with income generating ventures. She is also the Co-founder of WICI Africa, an African organization committed to continental cultural, ideological and social integration by inclusion, engagement and inspiration of the youth of Africa. As a result of her passionate work on child and youth education and empowerment, she was selected as a Global Youth Ambassador in April 2014 by A World at School, a digital mobilization initiative working to make education a reality for all children in the world. Dorcus decided to create A Million Faces-Renaissance, due to her own negative educational experiences. For her, the Kenyan education system lost its value to empower and only subjected students to an education where success was defined by grades, not the impact created with the knowledge acquired. Everyone was evaluated in the same way, and those, who did not get the grades, were left behind rather than being nurtured and helped along. She questioned whether or not getting bad grades makes one any less capable of having a positive impact on society. In response, she decided to pick up those that the system and standards of the Kenyan education system had left behind and work with them to realize their inner competence and talents to make them useful to society. That was how A Million Faces-Renaissance was born. 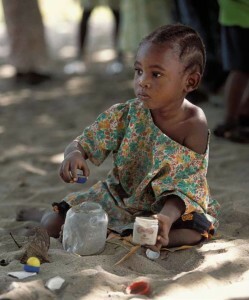 The nonprofit does not spend time ranking children and more time helping them identify and cultivate their natural competencies and gifts as well as to introduce alternative forms of education through creating new, flexible and inexpensive community-based programs for children’s development that responds to their needs, as well as geographical conditions of rural areas. Finally, it seeks to transform early education sector so that every child has equal access to educational and developmental facilities and the chance to participate in diverse learning opportunities. A Million Faces-Renaissance runs multiple programs. One of the key ones is the Play Clubs, which occasionally organizes play sessions in the slums in Nairobi, allowing children from ages 5 to 16, from deprived locations to play with different toys as well as interact with their peers. These kids are often continuously exposed to aggression and threats, while having little access to social facilities and poor health conditions. For them, playing becomes therapeutic, as a way to escape reality and relax. While A Million Faces-Renaissance does not currently have a specific place to hold the play clubs, the nonprofit plans to construct play centers in a few places in the slums that can be easily accessed by these deprived and traumatized children. Another key program for the nonprofit is represented by the Reading Tents, which constitute a literacy and numeracy campaign with the main aim of developing the reading culture in children which in the long run ignites the learning passion in children and making them ready for school based learning. 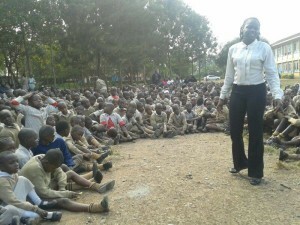 Around 100 children attend them each month, with 50 constant attendees. The reading tents are organized in such a way that children come together to engage reading activities where they are exposed to books, encouraged to read or, at least, admire the pictures in books for those that cannot read or write, so they can develop the interest to read and know the stories behind the pictures in the books. Currently, A Million Faces-Renaissance organizes reading tents every once in a month in collaboration with the Kenya National Library, which provides spaces and books for the kids to use. Working with volunteers, the nonprofit holds activities such as reading aloud, telling stories from pictures in story books for children who don’t know how to read, spellings, dictations and many other activities to develop their reading skills. In collaboration with another organization, called COBURWAS International Youth Organization to Transform Africa (CIYOTA), A Million Faces-Renaissance has also organized two annual Youth Leadership and Entrepreneurship Development (YLED) initiatives, which have already served around 120 high-school students. The second YLED training, which was held in Kyangwali Refugee Settlement, was targeted at 60 influential high-school students. The training brought together 14 experienced youth facilitators from Burundi, Cameroon, DRC, Ghana, Kenya and Uganda, who provided the students through entrepreneurship and leadership training, on how to identify community needs, provide and implement solutions as well as pitch the idea to investors. The students came up with five distinct income-generating projects they would want to implement as groups. Working with CIYOTA, the young Kenyan’s nonprofit conducts a follow-up on the projects to see them grow to fully fledged businesses. In 2015, Dorcus has a multitude of projects that she would like to accomplish. Firstly, she wants to hold two YLED programs in Kenya and the Kyangwali refugee camp in Uganda, respectively, while also continuing the monthly reading tents. She is also hoping to launch some new initiatives in the future , one of which is called the Renaissance School, aiming to help – students in their early education levels to explore their gifting and talents and best apply their strengths and interests to meet their learning potential. It will run on a curriculum focusing on learning concepts rather than skills, in inclusive pedagogy that ensures children with different abilities to learn together equally, and constant assessment and evolution of teaching techniques, rather than assessments of students’ abilities. Another program that the organization hope to launch later as it grows is the Child Sponsorship Program, aiming to help the rural poor children continue with their education at primary, secondary level, and higher institutions by providing tuition fees and the basic learning materials. With this program, the organization intends to have vocational training to help those who have dropped out of school because of different reasons to acquire livelihood skills training, to help them be self-reliant. One of Dorcus biggest challenges at the moment is effectively running the nonprofit’s activities without funds. She has made it work thus far, by partnering with organizations, such as the Kenya National Library, CIYOTA and individual volunteers to run projects, but is planning on more strategically fundraising to have the activities up and running. Another key problem that Dorcus’ organization is striving to tackle is the government’s refusal to support alternative educational approaches, due to its rigid promotion of examinations and their results. On the long term, the young changemaker hopes that A Million Faces-Renaissance will overcome this challenge and introduce systematic changes, by shifting the focus from examinations to building skills based in each student’s abilities and interests. Apart from leading A Million Faces-Renaissance, Dorcus is also the Public Relations office at Peace for Africa and Economic Development (PAD). Her role in PAD entails building and sustaining PAD’s relationships and stakeholders involved in PAD’s programming, including youth groups, local government representatives, and other civil society organizations. She also works in the Programs department in monitoring and overseeing all of PAD’s local youth county representatives, while also building and maintaining PAD’s brand, addressing reputation issues when necessary. Keeping herself busier than most, Dorcus is also a Global Youth Ambassador, mobilizing and organizing other youths to stand up for education and making her voice heard by organizing events, participating in campaigns, writing blogs and news stories, organize coalitions of like-minded youth groups for education, run petition drives and take part in other campaign activities. She also engage with the youth’s local stakeholders to achieve better results for education in the community in policy development, budget and other related processes.